In his SoundStage! 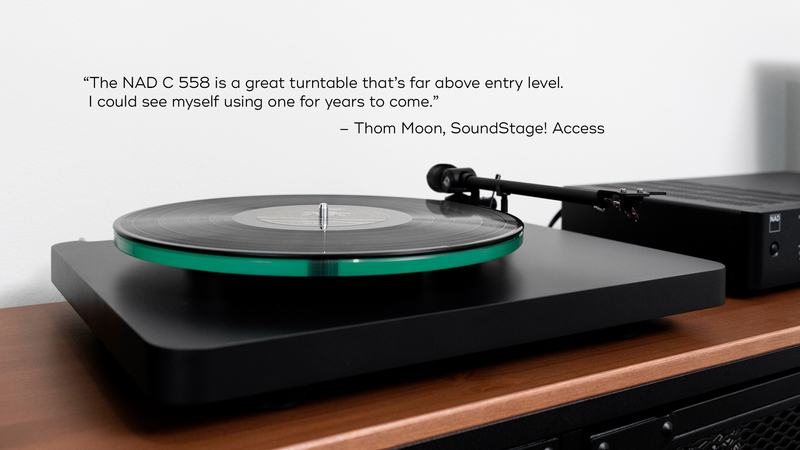 Access review of the NAD C 558, writer Thom Moon says that NAD’s flagship record player is “a great turntable that’s far above entry level.” Outfitted with a high precision synchronous clock motor and specially tuned vibration damping feet, the C 558 delivers an outstanding listening experience unlike any other. While listening to “You Can Call Me Al” by Paul Simon, Moon says he heard “excellent detail in backing instruments, a fine soundstage, and good slam on the deep percussion.” Switching to Art Garfunkel’s 1979 album Fate for Breakfast, Moon found that “Garfunkel’s ethereal voice was reproduced beautifully, with none of the slight sibilance I’ve heard from some other turntable-cartridge combos.” Moon enjoyed the C 558’s performance so much that he gave the album a second run-through.